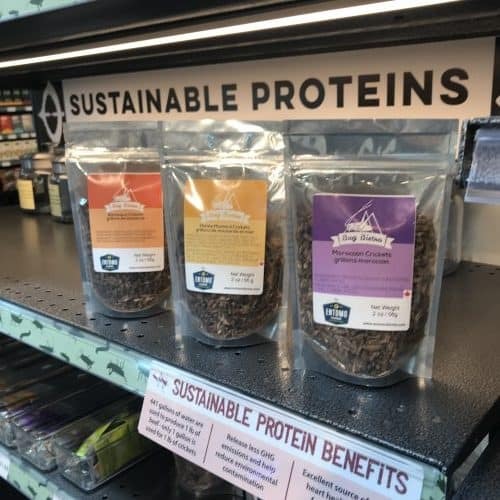 Since 2016, MOM’s has been selling cricket and mealworm products as part of our sustainable protein initiative. While many cultures around the world enjoy the benefits of eating bugs, we rarely eat them in the United States. We decided to start selling them because of their environmental and nutritional benefits. In addition to being an excellent source of protein, heart-healthy omega-3 fats, and important vitamins and minerals, growing bugs for food also releases less GHG emissions and helps reduce environmental contamination. On top of that, only 1 gallon of water is required to produce 1 pound of crickets. Beef production requires 441 gallons of water for the same amount of beef.